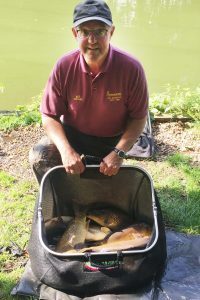 Round 21 of the summer was held at Reepham Fishery. This week was also the ladies match. There was 19 members today 3 of which were ladies. The lake had produced some tremendous weights in midweek so everybody was expected a good days fishing, how wrong we were! Mike Dossena drew peg 35 on the long lake which was end peg and ran out the winner with a good catch of carp and weighed 98lb 2oz well done Mike. 2nd was Matt Rowntree, Matt fished peg 12 which isn’t always that good one but he still managed 90lb dead ( that’s what happens when you put a good angler on a bad peg). 3rd place goes to the ever consistent Mark Charlwood. Mark fished peg 9 and weighed a very good 84lb 2oz.The 3 ladies struggled as much as the men all three caught fish. 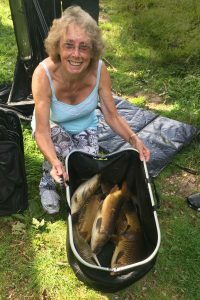 The winner was Val Burlton who fished peg 25 and weighed 38lb 4oz. 2nd was Judy Ford who fished 14 and weighed 21lb 3oz and 3rd was Chris Dearman, she weighed 1lb 13oz it was a very hard day for all. Next week it’s back to the Old Stables, see you there.